Bellonia is a genus of two species; B. aspera and B. spinosa. The genus range is limited to Cuba and Hispaniola within the Eastern Caribbean. Plants are shrubs 0,4-1,2m high. Stems are woody and arching. Leaves are opposite, (sub)equal, thin, sharply toothed to scalloped and almost holly-like. Flowers are borne in the leaf axils, and sepals are narrow and spreading. The corollas are white, flat-faced and actinomorphic with elliptical, rounded lobes. The genus is remarkable by (a) shrubby-woody habit, (b) presence of thorns in B. spinosa (modified axillary shoots), Bellonia is in fact the only spiny species of Gesneriaceae, and (c) white Solanum-like flowers exhibiting perfectly the syndrome of oligandrous pollen flowers (nodding flower position, rotate corolla, yellow anther cone, poricidal anther dehiscence, lack of a nectary; see Vogel 1978). The flowers are apparently buzz-pollinated by bees. Unpublished molecular data (J.F. Smith, pers. comm.) 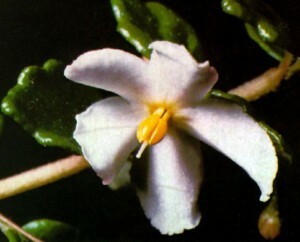 place the genus in tribe Gesnerieae.